Doesn't this board make you so happy?! I'm loving all these colorful options to brighten your home and your outfit. I love identifying that perfect piece of clothing that you know you won't take off all season long. This dress (on sale!. There is low stock. They also have it with a different fabric here and in white here.) is one of these 'uniform' type pieces. Cute and comfortable, it should be in everyone's closet. The colorful necklace is so fun. And this print is ideal on its own or as part of a gallery wall. I love the Otomi fabrics. I actually have a few framed and hanging in my daughter's bathroom. They are so vibrant. I just love the color combinations. This pillow would be the perfect summer addition to your bed, chair or sofa. Elevate your fun factor at your next party this summer with these adorable pineapple cups. The dresser or buffet is beautiful. The pompom blankets are so cozy and chic and have that perfect price. I have blogged about these pompom baskets before and now Furbish has a whole slew of them. I think they are amazing for the home. I would place mine beneath a console table and fill it up with magazines. They also have cute ones for the beach. The embroidered guest towels are perfect for a hostess gift so you get invited back. The trinket dish is sweet and this zebra is almost a copy of the one I keep on my desk. I adore mine and think someone needs it asap. Have a wonderful and bright day!! I love these posts from you. Always find things I've never seen. Hope it's a great week! Thank you so much for sharing our Pineapple Cups!! I LOVE your entire selection! 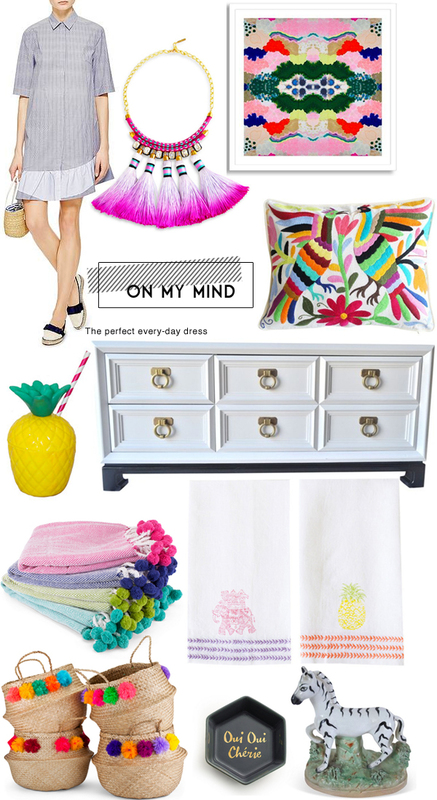 Especially the Pom Pom Baskets and the dresser!! I have been coveting those pom pom throws for a while - they are on my birthday wish list!